VIPERT Potable with Hypertherm and VIPERT Radiant with Dowlex are designed to perform as well or better than any other flexible plastic tubing in the market today. We are excited to announce the launch of VIPERT Potable and Radiant Tubing, a product developed in partnership with The Dow Chemical Company. 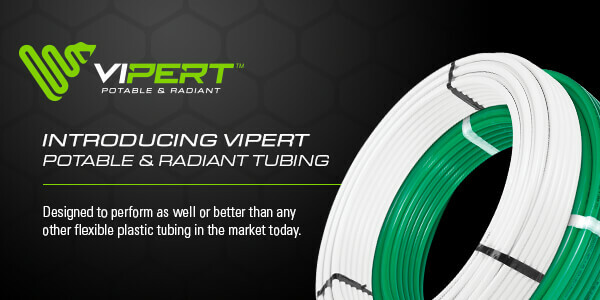 VIPERT Potable and VIPERT Radiant are designed to perform as well as or better than any other flexible plastic tubing. From installation to extreme cold, VIPERT maintains its flexibility better than PEX and surpasses all industry standards for hydrostatic strength Increased flexibility makes installation a breeze — and it’s recyclable. It also has a smaller environmental footprint and the same comprehensive 25-year warranty you have come to trust from us. Visit vipert.com for more information.